This is a list of Schrade Old Timer models. This is not the definitive list of Old Timers, it is merely a starting point. This list is based on a number of Schrade price lists. In the early seventies they published what they called their Line. In 1983 they begin publishing a price list called a Shortline Catalog. Somewhere in there, they also started publishing a Retail Price List, and a Distributor’s Price List in addition to the picture catalogs that did not have prices listed, but did include descriptions. I have these from 1973 through 2004, with three notable exceptions 1977, 1994 & 1995. Is important to note that, as a pattern was introduced or discontinued in one of the years where I do not have a catalog will not be noted as new in 1994-95, in the case of the 140OT. The retail price shown is the last retail price I have in any of the lists that I currently possess. 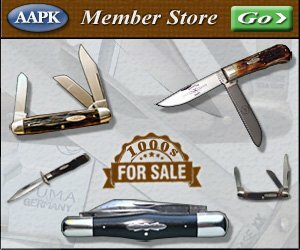 If a knife was discontinued in 1994 or 1995, the last price shown will be the 1993 price. In the details column you will hopefully find a description of the knife with any other information I have, whether it is gathered from the price lists, catalogs, books or other sources. Hopefully most of the information is correct but the possibility always exist that I made a mistake or there is a difference in what Schrade published. You will notice a number of knives that have no information, other than the model number & the description. That can be for a variety of reasons. For example, the 2OT was made in the 1950s or 1960s, long before any of my catalogs or price lists were printed. The 15OTO, is a 15OT made with a orange Delrin handle. This may have been a SFO (Special Factory Order) for some company such as Smoky Mountain Knife Works, notice that the 165SM is a orange handled 165OT made for SMKW. SFO items do not usually appear in the Schrade catalogs & price lists. The 512OT, a stainless steel version of the 152OT, does not appear in any of the lists I have, though somewhere I received info that it was made between 1989-1992. There are inconsistencies in some of Schrades catalogs, for example; the 147OT, Pro Fisherman is listed as 13-1/2 inches from 1993 through 1999. After that it is listed as 12-1/2 inches. The only way to know for sure is to compare a known older model to one that is made in 2000 or later. If anyone has two such knives & would compare them and email me with the results I would love to know it the knife was really made in two different lengths. I have received so much information from so many people that I have forgotten where it all came from. Some info came from members of this forum & other forums. But I would like to especially thank Larry Vickery (LRV) & Rich Langston (lt632ret), as I got a number of price lists and a wealth of information from them. Thanks guys! If anyone has a copy of a price list from 1977, 1994, 1995 or any pre-1973 catalogs, price lists or other sources and would like to share them with me I will incorporate that info in the list. Remember, Schrade was notorious for not being extremely accurate with their catalogs and price lists. Their main concerns seemed to be making knives and not catalogs. I am sure there are probably Schrade models that do not appear in the catalogs, especially when it comes to those End of Days knives, those that were made just before Schrade closed. There are some strange things that came out of the factory, such as, the 97OT with Uncle Henry Staglon handles and a single clip blade. Remember, this list is a work in progress. I hope to be adding the Uncle Henry line, some of the Open Stock knives, as well as some of the scrimshaw and some of the special addition knives, plus the later knives such as the AV2, CH4, SLW2, etc . This is definitely not the last word in Schrade numbering and prices. This is merely a beginning point and I hope to update this as I get new information.